Welcome to the FullStory family – we’re glad to have you join us in the movement to make the web more user-friendly! It’s super small, asynchronous and designed to be unnoticeable to your users. You can read more about the negligible performance impact of FullStory in this article. No need to instrument any elements in your application or site. Once the FullStory script loads, it records all in-browser interactions and mutations. Don’t fret about how to record that particular “submit” button – if it’s in the page, FullStory sees it, records it, and makes it available to search. While you’re installing, you’ll likely want to think about excluding some elements. 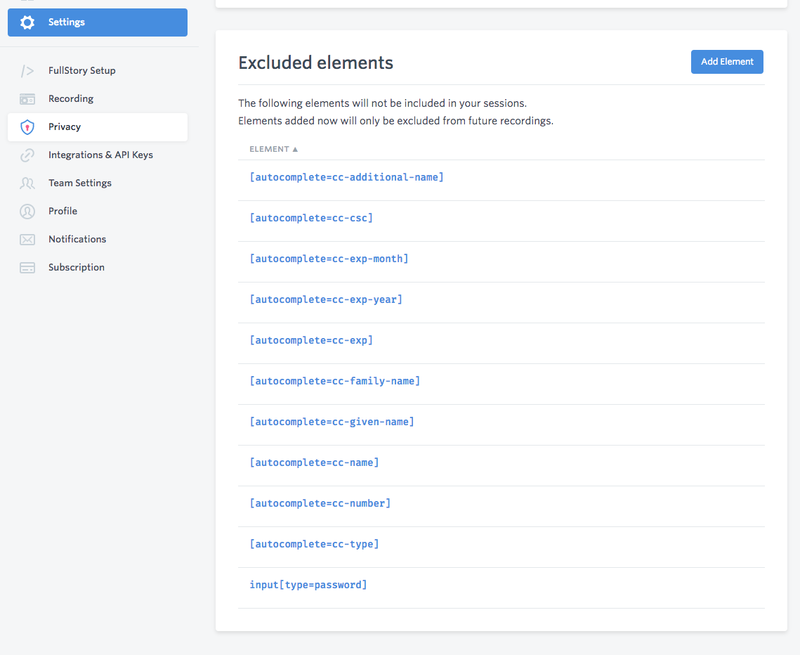 FullStory allows you to block sensitive data from being recorded through a construct called “Excluded Elements.” It allows you to identify the CSS selectors of data you want to keep private. The privacy of your customer data is a shared responsibility. FullStory diligently ensures that your customer data is securely stored and accessible only to you. In addition, we provide you a tool to easily exclude sensitive customer information. Within Settings you’ll notice an area called Privacy. You can add elements (identified by CSS selectors) to block any data from those elements from ever being captured. Excluded data never leaves your customers browser. Which is exactly what you want. You can also use Inspect Mode to quickly add excluded elements. FullStory is better with friends. While you wait for sessions to roll in, go ahead and invite your teammates. As sessions start recording, you’ll see them populate in the main FullStory screen. The green “Online” icon indicates that the user may still be online and the session is still recording. The blue icon with the date and time indicates the session is complete (we close sessions after 30 minutes of inactivity). Once you've clicked on a session, the icon will no longer be filled in with color, indicating that it has already been watched. The watched indicator is at a user level, so your teammates will not see a session marked as watched if they haven't watched it using their own login. FullStory provides a mechanism to pass in non-session-specific variables via our API. Common use cases include unique identifiers (e.g. application ID “friendly” names) and data about things like subscription level, items in cart, and tools integrated into your platform. FS.Identify– supports the passing of a unique identifier like application ID (optional), email address and an optional “friendly” display name. Learn more about installation here. FS.setUserVars – supports the passing of any field value pairs into the system, making that data available for indexing and search. Learn more about installation here. FullStory offers native integrations with leading platforms including Desk.com, Help Scout, UserVoice, Zendesk, and Olark. These integrations place a link to the FullStory recording into your help desk platform as an attachment to the ticket, so your customer service agents can see what happened before, during and after a ticket was submitted. You can also integrate with communication tools such as Slack and Trello or project management tools like Bugsnag, JIRA, or Mixpanel. Every integration gets your current tools tied into FullStory so you always have a FullStory session to settle all bets. Need something we haven't built? Roll your own with FS.getCurrentSessionURL(). Watching all sessions is nearly impossible, not to mention has very little analytical value. Try FullStory’s powerful search capabilities to narrow down recordings to only those relevant to your query. With OmniSearch, you just type your thoughts into the search box and we help you get where you're going. 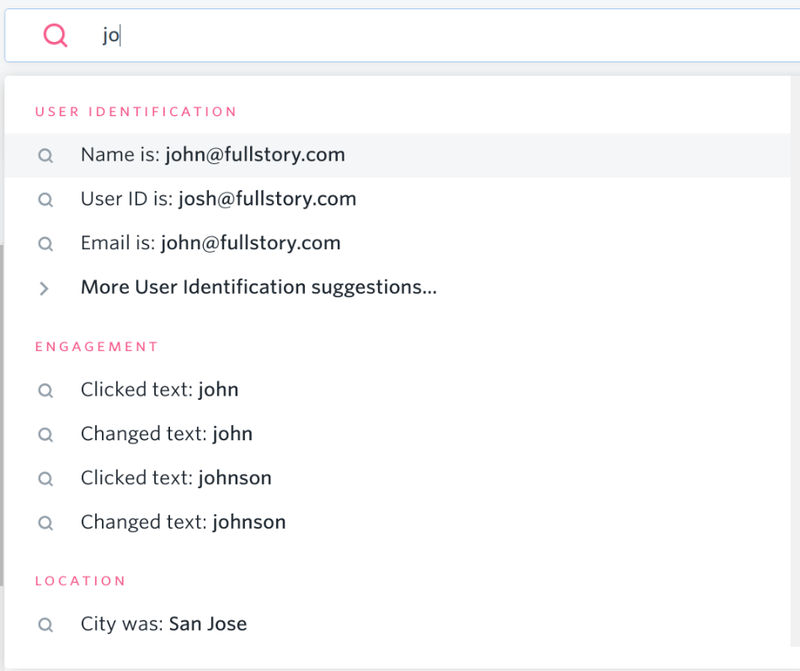 Look at user-centric variables like location, operating system, browser, and device, or search based on any of the custom variables you’ve pulled into FullStory. Search by pages visited, path, query parameter, etc. Search by any element in a page and how a user interacted with it, like form fields changed, or objects clicked. When you build a search you’d like to repeat in the future, just click the “Save Segment...” button to add this search to “Your Segments.” You can revisit your segments later, and even share them with the rest of your team. To learn more about Search and become a Search Star, take a look at our detailed user guide Getting Acquainted with Search.